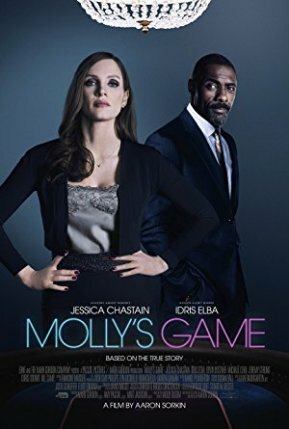 MOLLYS GAME is based on the true story of Molly Bloom, an Olympic-class skier who ran the world's most exclusive high-stakes poker game for a decade before being arrested in the middle of the night by 17 FBI agents wielding automatic weapons. Her players included Hollywood royalty, sports stars, business titans and finally, unbeknownst to her, the Russian mob. Her only ally was her criminal defense lawyer Charlie Jaffey, who learned that there was much more to Molly than the tabloids led us to believe. Bloom was a supremely talented skier, close to making the Olympic team but an accident left her in search of another opportunity. Moving from Colorado to California, she gained employment as the personal assistant to a man who runs underground poker games on the side. Moving from Colorado to California, she gained employment as the personal assistant to a man who runs underground poker games on the side. She quickly and quietly became the brains behind the operation, corralling and controlling the A-listers who congregate weekly to play. But cut to present day and shes waking up to find the FBI outside her door, waiting to take her in. Sorkins script glides between the two timelines as Bloom recounts her ascent and descent within the high-stakes poker world to her lawyer, played by a shakily accented Idris Elba. We also get glimpses of her childhood and a fractured relationship with her therapist father, embodied by a grizzled Kevin Costner. In a bloated runtime of 140 minutes, we get a lot, arguably too much. Sorkin is spellbound by his subject, fascinated by the many details of her admittedly impressive life, but the magic he clearly feels fails to translate on screen. The experience of watching Mollys Game feels a bit like hearing a long, rambling story from someone high on something, a frantic, exhausting splurge of information that never truly justifies its existence. In the very first scene were bombarded with an overstuffed, overwritten voice-over, delivered with dry disinterest by Chastain, and it becomes his crutch throughout, oversharing exposition with surprising clumsiness. While its refreshing to see a film about a woman succeeding in business, its disappointing that it takes a lot of effort to be interested in it. The book is better than this.